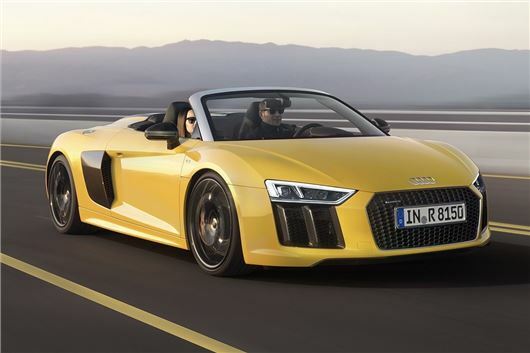 First deliveries of the soft-topped version of the Audi R8 will start in late 2016. The canvas-roofed version gets the same 5.2-litre V10 engine as the coupe, sending drive to all four wheels via Audi’s famous quattro system. From 0-62mph the R8 Spyder is 0.1 seconds slower than the coupe, covering the spring in 3.6 seconds. Peak torque is 540Nm at 6500rpm and top speed is 197mph. Fuel economy isn’t exactly fantastic at 24.1mpg, nor are emissions at 277g/km, but for a high-powered supercar those figures aren’t bad at all. Not that running costs are a primary concern in a car that is likely to cost more than £130,000. The folding fabric hood can be operated at speeds up to 31mph and takes 20 seconds to fold down. Additionally, the rear window can be raised or lowered on the go independently of the fabric roof. The R8 Spyder has some additional aluminium to stiffen the structure, but is otherwise very similar to the Coupe in terms of styling and even weight. In case the wind and V10 sound get boring, there’s an optional Bang and Olufsen audio system that includes headrest mounted speakers, plus there is a new infotainment system with better smartphone connectivity. This allows the driver to display information from their phone in the Virtual Cockpit instrument binnacle. Being an Audi there is a big range of customisation options, including various colours for exterior components like the front splitter, a selection of different seat and upholstery options and various alloy wheel designs up to 20 inches. There is also a wide range of colours including Argus Brown Metallic, exclusive to the Spyder.